If you are concerned about covert eavesdropping or wiretapping, then it would be wise to contact Granite Island Group, or another TSCM firm and schedule a "Bug Sweep" or TSCM Inspection. However, do not call from a suspect telephone, cellular telephone, or cordless phone; and understand that it is critical that you should get someone out to your location as quietly, and as quickly as possible. The above three pictures are of a common 25 line terminal or demarcation box which is used by the phone company for many business telephone installations. This particular one was found behind a law office. Notice how there are no locks or security devices on the box, an eavesdropper can simply walk up to this box and attach a bug or tape recorder in under ten seconds. This is one of the easiest locations for any eavesdropper to listen to private calls being made. In the case of a residence the box is typically much smaller, but no more secure. This is often called a "demarcation point", and most people are completely oblivious to how vulnerable this box is to eavesdropping. 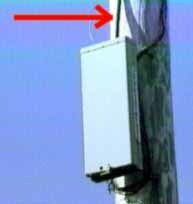 The above is a standard pedestal box used by the phone company for newer home and residential installations where the phone wiring for the house is buried. Private investigators and amateur eavesdroppers love these pedestals, as they can run up to it and install a tape recorder or other bug device in under 15 seconds without actually getting close to the house. In many cases the pedestal box will actually contain all of the wires which support the telephone service for the entire neighborhood. This in turn allows neighbors to listen to each others phone calls by simply twisting some wires together (no actual bug is needed). Tampering of this nature is commonly called "bridging", and it is a very serious threat (which cannot be detected by "spy shop" tap detectors, or simple DC voltage tests). Law Enforcement and intelligence agencies rarely put a bug this close to a subject (unless it's a tactical situation), but it is very popular with amateurs. Standard Phone Company Demarcation boxes for Home and Business installations. All three have been manipulated, bugged, or wiretapped, the first one (far left) has an extra wire which ran to a tape recorder in a near-by apartment. The one in the middle has a parasitic RF transmitter from Japan on it (available at most spy shops). The one on the far right has two demarcation boxes (one is legit and the one with the red arrow contains a fairly sophisticated wiretap and RF transmitter). This is one location on the phone line where a professional eavesdropper likes to install a bug or wiretap. It can be placed in the cabinet, in the "boot", on the cable, or anywhere between the phone company's building, and the targeted person or business. Notice that this cabinet is also unlocked, which is a common problem. Lack of security at these boxes make them very attractive and tempting targets for both amateur and professional eavesdroppers. This is one of the more popular places to install a covert transmitter, bug, or wiretap. The cabinet provides access to hundreds of sets of phone lines, and provides a lot of extra space to conceal tape recorders, transmitters, and similar listening devices. The cross connection boxes is another place where both professional and amateur eavesdroppers like to plant bugs and wiretaps; an 1800-pair pedestal (phone service to 1800 customers). This one has a set of bypass wires installed on a terminal block (red arrow). Notice that it is unlocked (which is very common), and in the rare event they are locked they can be quickly opened with two paper clips or a master key. From this location any of the 1800+ customers phone lines can be easily tapped, bugged, or monitored. This is another place where the eavesdroppers like to bug and tap; the loading coil. A loading coil is normally used by the phone company to balance out problems with longer lines. As the distance between the phone companies central office and customer increase to over several thousand feet these coils become required to maintain a quality connection (to compensate for excessive capacitance). A loading coil tends to "eat" the diagnostic signals which many TSCM equipment generates (TDR pulses). This makes it a good place for bugs and wiretaps to be installed as they will be tough to detect. Usually the bug or wiretap is placed several miles "downline" from the target location and is often hidden in a "boot" near the loading coil. Bugs and wiretaps installed at the loading coil will be virtually impossible to detect with spyshop bug detectors, and other related toys. Checking a loading coil for bugs and wiretaps requires highly specialized equipment and methods. A small cheap parasitic radio transmitter was located in the "boot" on the left. The boot was located 18 feet in the air above an area where it was impossible to set up a ladder. The bug was virtually invisible to the naked eye, and was only located though the use of sophisticated instrumentation (which locked onto the bug from several hundred feet away). Spy shop bug and wiretap detectors could have never have detected this bug. The boot on the right is a "disguise boot" and actually contains a radio repeater for an ultra low powered audio bug (183 MHz, WFM) installed in a nearby office 75 ft away (excellent installation and product selection). This is a spread spectrum phone line bug or transmitter operating in the 915 MHz ISM band. 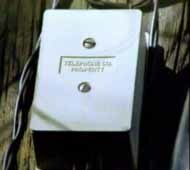 It was found on an ISDN line and was mounted high on a telephone pole nine feet off ground. The bug was disguised to look like a legitimate piece of phone equipment (same type of case, color, and markings). All three of these phone boxes have "extra" wires running from them. The wires cannot be easily detected unless the boxes are very closely examined.